I've heard about onsen geisha as being some of the humblest and low-ranking geisha around. It may sound a bit unusual to be interested in them, but I guess I have an interest in diversity. Or is it that people who are going there are going "on holiday", as it were, and behave differently, and expect different kinds of entertainment, than the way they'd behave in the city they lived in? Do onsen geisha still exist nowadays? I've heard that there were a lot of geisha before world war 2, but that the number of geisha has declined dramatically, and I wonder if onsen geisha would be the first to disappear. Are geisha who perform at onsen towns necessarily onsen geisha? Sometimes when I'm searching the web for information on onsen geisha, I come across pages with mention of "(Location Onsen) geisha". For example, One of Nagano’s “Treasures” — The Togura Kamiyamada Onsen Geisha is an article I came across - would such geisha be onsen geisha, or just geisha who happen to perform at an onsen town? Also, are the geisha at Atami "onsen geisha"? I'm not even sure that "onsen geisha" is a real term, rather than just an insult! If they do exist, in which respects do they differ from their big city counterparts? Do they have a different personality? Do they differ in what kind of music they perform, and kind of ozashiki asobi (games) they play? I hope this isn't too controversial a topic for my first topic on this forum! AFAIK there are still geisha working at resorts; Liza Dalby mentions visiting one of these resorts in the 70s and I'm pretty sure I've seen photos of geisha performing at large banquet halls at resorts. However I don't know if they're referred to as 'onsen geisha' or if there's another term used. The chapter in Liza Dalbys book concerning geisha in Atami which is an onsen is titled "geisha in the country" ( \I have to translate it back) as opposed to geisha in cities. In this chapter she describes a drunken guest who rudely asks ( He calls her "obachan" = grandmother/old woman ) a geisha to play shamisen. The geisha let it pass and plays, but he is not able to sing along and after a while calls for the manager to complain about her. When the manager comes, the geisha says that if there is a geisha who plays shamisen better than she does, she would like to meet her. That is not exactly humble. That is the voice of a confident musician. A geisha is someone who plays shamisen, dances, is well versed in conversation and wears kimono, not to mention the fact to be able to sit in seiza for hours. I tried my hand at shamisen, it was painful. To hold the plectron with three fingers and at the same time concentrate on what I was doing, my teacher told me not to look at my shamisen....well, I stopped. If one wants to earn money with pillow work, it is much easier to become a bar hostess. The dances are more formation dances, as there are sometimes up to 600 people to a party. This comes when companies arrive. So, unlike in Kyoto or Tokyo a geisha who works in a hot spring resort rarely sees a customer twice. It is custom for hot springs that people wear yukata, the most informal wear during the day. It may be easy to slip out if this in a jiffy, but as holiday making in Japan is insanely expensive, they sleep (genders seperatly ) in groups of 15 people in one room. That would mean that a geisha has to meet a man outside a hotel with possible 599 witnesses. The geisha Liza Dalby visited said that a geisha who would do this, would be cut. And probably soon be out of work. Surely the rather skimpy clothes on the side of the customer ( a geisha will always wear silk, anything alse might be disrespectful ) plus alcohol may lead to phantasies, but thats what it is, a phantasy. I really recommend Liza Dalbys book. There may be less geisha today than in her time, but I think the basics are still true. The geiko of Kyoto are surely very sophisticated with a lot of traditions, but to call geisha who work in hot spring resorts " some of the humblest and low ranking geisha " sounds a bit sad. I am curious. Where did you find this description ? I hope this helps you to find more information about them! I did a little research of my own and discovered several pictures of the geisha! Ok so I discovered the okiya and who lives in them! I saw a program on NHK that visited onsen geisha. They were mostly older ladies that had been doing this their whole lives. As far as I can tell, some had families and did this as a job they went to from their homes. The course of the evening seemed to go in a similar manner to one in Kyoto, however the guests were in a hotel area. Games, drink, song, dance, etc. Everyone seemed to be having a great time. There were men and women as guests and I'm guessing they were tourists. Honestly, they actually looked like they were having more fun than the ladies of Kyoto with their beautiful, sophisticated way. The geishas I had dinner with spoke a bit of English. I can't really say how much English they could speak, because having a translator available meant they mainly spoke in Japanese. They had had foreign customers before the Tohoku earthquake and tsunami, but none since. They hope to see more foreigners come! They did a dance for a male guest (me), and one for a female guest (my translator). I didn't know about different dances for women before. We played a few ozashiki asobi. We played "Konpira Fune Fune", and "Ohirakisan", and a drinking game with a small, a medium and a large cup (I don't know the name of it) - does anyone know the name of it? 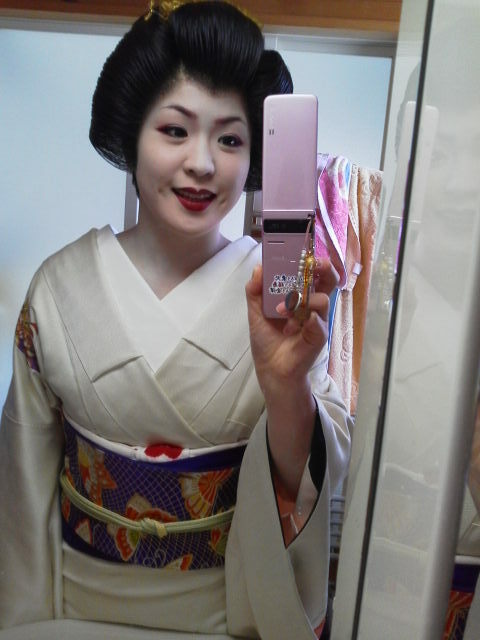 I also learnt that geishas from different parts of Japan don't necessarily wear white make-up. I also happened to have my photo taken with a geisha while celebrating the Dontsuku festival (don't google this festival at work!) in Izu Inatori, Shizuoka, which is south of Atami.